This fan edit of George Lucas’s second Star Wars prequel subtly trimms conversations and actions. A lot of babbling has been removed. Trooperman). For example, my elevator conversation between Anakin and Obi-Wan is almost exactly like The Phantom Editor’s, though I only recent checked out his version, looking for things to steal, as it were. And in re-shaping the romance of Ep. II, I came to a similar conclusion as Trooperman and went from the telekinetic fruit scene straight into the kiss. My version of the aborted kiss is somewhat like The Phantom Editor’s, but at the risk of sounding smug, I think my musical transitions are better coming out of that scene. Anyway, my primary philosophy going forward with this edit was that if you make everyone talk about half as much, you lose no crucial information and gain lots of needed momentum. So while many of the larger changes will be evident upon watching, there are also many instances where conversations and actions have been subtly trimmed. I always liked the Obi-Wan story in Ep. II, and even have a soft spot in my heart for Dex and his over-accessorized diner (I can hear you navigating away now… just roll with me). My primary beef with this chapter, like so many others, was with the love story between Anakin and Padme. I attempted to make it as simple as possible, so here’s the crux: Anakin loves Padme, and Padme would love Anakin, but she still thinks of him as a kid. That’s it. That’s the whole arc. It’s Padme realizing that the little boy from Tatooine has become an exceptional adult, and their bond is sealed as she watches him suffer through the death of his mother (which is a more internal process for Anakin in my cut, as you’ll see). Of course, that’s tricky, as there was very little of that “exceptional adult” to be seen in the theatrical cut of AOTC, but I think in making him less talkative and focusing on his acts of bravery, you can sort of get there. assassination plan, perhaps ’cause her super-duper reflective ship blew up, who knows. There are certain things I’ll let go for the sake of rhythm. intermediate CU of Padme when Typho tries to get here to leave. It was so obviously shot on a different day. - Palpatine’s office begins right with Palpy talking about systems threatening to secede, into “do you really think it will come to war?” This scene is a lot shorter, with several common changes such as removing Yoda’s excellent but poorly placed line about warm feelings in his heart. Yoda’s rection shot which used to accompany Palp’s finishing of Padme’s sentence not goes over his initial suggestion that Obi-Wan guard her life. He never finishes her sentence here… that always felt off to me. Padme generally puts up less of a fight in this version but voices her complaints later to Obi-Wan. An example of something that’s not really THAT interesting (Padme’s willfullness) that they still felt the need to hammer home four or five times. One and a half does it for me. - No gundarks for Obi-Wan and Ani. This scene is trimmed up quite a bit, with “we will not go through this again” moved up earlier to match the lip movements of and replace Obi’s “we will not exceed our mandate”… stuff like that. The scene wipes away before Anakin can whine to Jar-Jar. - The second attempt on Padme’s life is edited a bit differently. The scene of Zam putting the worms into the probe is cut, though she still receives them from Jango. The muffled dialogue does not carry over to the shots of Padme sleeping, and a bit of the Anakin-Kenobi conversation is placed after the worms arrive, in an attempt to stretch the time and build suspense. - Speeder Chase… no funny aliens yelling at Kenobi, no power couplings, Anakin’s dialogue is trimmed considerably, and Obi-Wan’s chiding of Anakin when they “lose” Zam is a lot shorter. - In the Cantina, the “death sticks” scene is cut. Ahmed and Lucas girl are out. They walk in, look around, then Obi-Wan says “go and find him”. The ‘him’ was taken from a later scene with Obi, Mace and Yoda, then pitch shifted down a touch to match the inflection. They don’t know it’s a she. No shape shifter stuff either. When Zam get the dart in the neck, I had someone do a little ADR for a death croak. I’m tired of huttese curses. - Jedi Council scene is a bit shorter, but no real information lost. - Anakin/Palp’s scene ends after the word “invincible”. I was also tired of people telling other people what kind of Jedi they foresaw they would become, a la Qui-Gon/Kenobi in the swamp in TPM. Show me, don’t tell me. 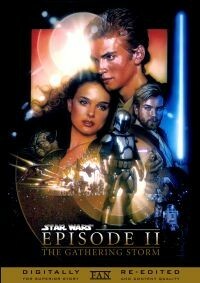 - Anakin/Padme begins later, with Obi-Wan promising Padme he’d get to the bottom of it. I kept “at least we have R2 with us”. A harmless little moment of levity between Anakin and Padme. I like it. So sue me. - Yep, I kept Dex’s diner, but it begins with Obi-Wan getting up from the booth to meet Dex, so you lose the lame kiss-my-grits waitress robot, aswell as the reference to whatever juice it was that Obi-Wan was so eager to drink. Sounded like Jamba Juice to me. Obi-Wan says “hello Dex” when his back is to the camera and he’s hugging the foul creature. Their ensuing talk is a bit shorter too. - There’s no scene of Mace, Obi and Yoda talking. No deleted Mace/Obi scene either. If there’s one image from the prequels I got tired of fast, it’s two people in robes walking side by side and talking solemnly. - Yoda and the Younglings remains, but I tightened it up as best I could. Is it just me, or does Liam take forever to answer? Not anymore. I also kept this scene to help set up the slaughter in Ep. III. secret marriage in episode III, and that may be stretching it, but worse comes to worst I feel like I can re-iterate things like that in a revised crawl for Ep. III if need be. - Anakin meeting the family is back, baby. I like that scene in the kitchen. - The packing scene is not included. - The order of scenes and intercutting between Kamino and Naboo is changed around a bit. Obi-Wan’s business with the Kaminoans is largely unchanged. Back on Naboo, Anakin and Padme have the picnic. The scene ends after Padme accuses Anakin of making fun of her and he laughs. “I’d be much too frightened to tease a senator” is gone. What a weird line. - Jango and Obi-Wan’s first meeting is altered just a bit to speed up the pace. - As mentioned earlier, the fruit eating scene leads right into the kiss scene on the balcony. The line about Obi-Wan getting grumpy is gone. The near kiss by the water starts as they get to the railing. It’s pretty much wordless. It’s also been color corrected to approximate day-for-night. Itlooks okay, especially if you convince yourself it’s about 8pm and not 11pm. It certainly holds up well to the day-for-night stuff in a movie like Jaws. Ah, simpler days. They don’t kiss as long here as they do in the original cut. - There is no fireplace scene. The day-for-night balcony scene functionally replaces it. - Jango and Obi-Wan fight is pretty much unchanged. Never had beef with that. - Anakin’s nightmare is gone. I’m not interested in any of that superimposition dream sequence type stuff. She mentions it, that’s enough for me. The scene the next morning is trimmed up as well. So many long pauses… I couldn’t get all of them. - I kept the asteroid chase, but removed some of the dialogue that bugged me, i.e. “this is why I hate flying” and Boba’s snickering. You know, the usual stuff. - Tatooine. Lots of changes here. No “okey-dokey” robot. Watto doesn’t drop the spanner with that ‘boing’ noise. Most importantly, there’s no interruption in Anakin’s search for his mother. It wipes right from him talking to the Jawa to him on the cliff. Shmi’s death is also quicker. After Anakin freaks out, it doesn’t iris wipe to Yoda lamenting about how Skywalker is in pain. We know that, we just saw it. And I always found it strange, the conceit that Yoda knew about Skywalker’s anguish and yet they never reach out to him and continue to keep him at arms length. Was there ever a conversation about that “terrible pain” when Yoda and Anakin found themselves in the same room? In Lucas’s world, I bet there wasn’t. I’d rather assume Yoda doesn’t know what happened. Here, Anakin’s slaughter instead iris wipes to Obi-Wan ascending the steps on Geonosis and discovering Dooku and his confederates. The first part where he sees them walking through a hall is cut… he simply finds them all at the conference table. - Anakin brings his mother back. Obi-Wan sends Anakin a message to re-transmit. There’s a much shorter funeral (Anakin never drops to his knees and grabs the dirt… he just “misses her so much”), interrupted by R2 with the transmission. I took out the “I slaughtered them” confession to Padme entirely. The frustration with Obi-Wan seemed too forced… I think there’s plenty of REAL reason for Anakin/Kenobi conflict when Ep. III comes around. His confession also made him way too unappealing in my eyes for Padme to then fall for him. Obviously, you lose the “I will be able to stop people from dying” statement, but I always found that WAY too expository. By the time Ep III rolls around, we still get it. He lost his mother. He doesn’t want to lose Padme. I think it was overdone in the original cut and done awkwardly to boot. The added benefit of removing this scene, is that when Palpatine mentions Anakin’s mother and the sandpeople at the beginning of Ep. III, it says something that he was able to share that with his mentor but not with his wife. - Anakin and Padme in the little ship leaving for Geonosis… I cut out a bit of Anakin’s whining. Unfortunately, that’s really all he does in this scene. Still, it’s better. - Things are generally untouched for a while here… Jar Jar sells out the republic, Dooku tempts Obi-Wan (a scene I always liked if only for Lee’s performance), etc. - Anakin and Padme arrive on Geonosis. C-3PO never leaves the ship… a common edit at this point. Sections of the factory scene are gone, i.e. the weird shot where Anakin does a downward thrust with the heel of his saber but is only hitting thin air. R2 jets remain. Anakin’s line “Obi-Wan is gonna kill me” does not. Padme: I’m not afraid to die. Anakin: (disbelieving, she’s already rejected his advances) What are you talking about? Not perfect, but it passes much quicker. And you lose the terrible “I’ve been dying a little bit each day” line, not mention Anakin’s “but I thought we had decided not to fall in love” and so on. Have you ever seen a love story where the word “love” is used more than in AOTC? They’re constantly saying it. I tried to take it out until her pledge. shown is a little suspect. And you know what? I like Mace’s “this party’s over” line. A little colloquial and modern, perhaps, but even Han’s “then I’ll see you in hell!” felt wrong ever since I was 10 and could ponder the existence of hell in the Star Wars universe. Plus, when you step back, Dooku is overseeing a dumb little, Batman-villain-style execution party out there on that backwater planet, and Mace’s line seems like a funny way of acknowledging that. Some of the Jedi in the battle annoyed me. There have been a few cuts. Jango’s pistol twirl is gone, if only because the footage of Dooku turning back to the battle looks like it was reversed digitally. - Leaving the arena and moving out to the open battlefield… the two instances of Dooku in the Geonisian war room have been combined into one. Dooku walks in, the Neimodians say how the Jedi have assembled a huge army, they must get the ships back into space (this line has been pitch shifted back up a tad… they were clearly trying to mask the fact that they didn’t have the original voice actor for this line, but it still sounds better with less of an effect on it), then Dooku talks about his master and the republic’s treachery, and the alien dude hands him the plans. I cut around the death star hologram a bit so it’s less obvious until Dooku fires up his palm pilot. - For a while I tried to leave out Padme’s “getting up” moment, and just had her show up after the duel, assuming you could use your imagination, but I ended up putting it back in. It trims the beginning moans off the scene, one of her ‘no’s, and her silly run, so it happens VERY quickly. If all else fails, get through it quickly… you should see my edit of Otoh Gunga. - The duel between Anakin and Dooku is trimmed up a bit. About half as much of the colored light fight in the dark, some shots were reversed to increase visual logic, and the shot before Anakin gets his arm sliced is slightly different, as the move Dooku made to get himself in position to get Anakin’s arm made NO sense in the theatrical cut… it just came out of nowhere. - Dooku throws one fewer piece of debris at Yoda. We get it. Yoda doesn’t hop all over the walls to no effect. - From there on out, it’s pretty much intact. I trimmed up the Dooku/Sidious talk ever so slightly just to speed it up. Old people. There you have it. I really wanted to see what I could do with the footage provided, and I’m happy with the result. Everyone’s got their own opinions, but I do believe that there are at least a couple people out there for whom this edit will really work.